All posts tagged "Eddie Lacy"
This week, we look at two players from the same team competing for touches. Who will rise up from a down season back to dynasty stardom? 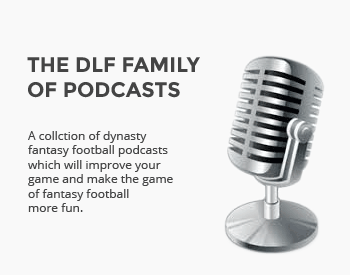 The DLF team suggest some names to acquire before it's too late. We look at some backfield stars looking to bounce back in 2016. The DLF staff takes a look at some undervalued players. We identify some players with the same value in the June ADP data. Who would you choose? How risky is each dynasty back to own? We cover the safest ones first. We dive into this week's questions. We round up the best tweets of the week. Dynasty Debate: Trade your 2016 rookie picks for 2017 picks? Is it better to have 2016 or 2017 rookie draft picks? Nick Whalen and Nathan Powell debate. We answer your questions in our weekly mailbag. We examine our Top 12 running backs. We answer your submitted questions. We cover the fearsome group of dynasty players in Green Bay.